Live Nation has announced that three of the most incendiary bands from the "alt rock" era are coming together to tour arenas throughout the U.K. this September. THE CULT, THE MISSION and KILLING JOKE will be hitting the road together for the first time in celebration of the dazzling trails they’ve continually blazed through the musical landscape since their respective inceptions. This incredible tour, the likes of which hasn’t been seen before, will be hitting arenas in Newcastle, Sheffield, Manchester, Birmingham and London. 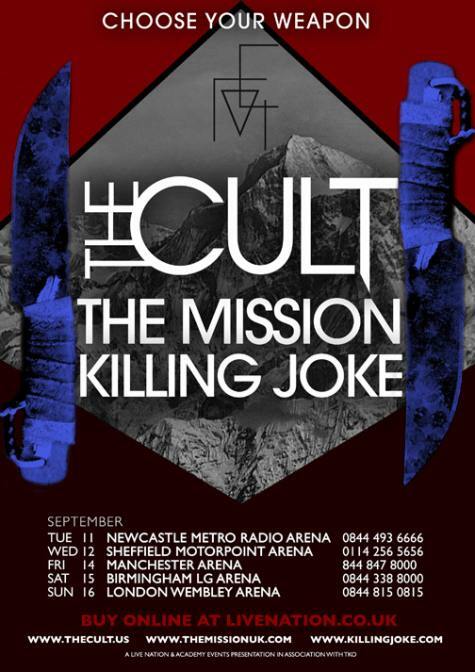 THE CULT, THE MISSION and KILLING JOKE tickets will go on sale on Friday, March 23 at 9 a.m. and will be available from LiveNation.co.uk. brand new studio album, "Choice Of Weapon", due for release via Cooking Vinyl on May 21 in the U.K. (May 22 in North America). The album was written by Ian Astbury and Billy Duffy, recorded in New York City, Los Angeles, the California high desert and the band’s Witch Mountain studio between July and December2011. Longtime CULT collaborator and producer Bob Rock, who produced one of THE CULT‘s most successful albums, the platinum-certified "Sonic Temple", put the finishing touches on the foundations that were laid by co-producer Chris Goss. The new release features founding members Astbury on vocals and Duffy on guitars, with drummer John Tempesta and bassist Chris Wyse. On this incredible gathering of vitally important musicians, Ian Astbury had the following to say: "This is a fantastic bill and these will be magical shows ,a unique occasion that we look forward to with great anticipation. The band is killing it right now and we are excited to get back to the business of playing live." Speaking on the tour, Wayne Hussey had the following to say: "It’ll be great. We played a festival show in Belgium with THE CULT back in October last year and it was really lovely to see Ian and Billy again, it was like no time had passed at all. We’d gone our separate ways over the years and travelled different roads but I always think of Ian and Billy as brothers in arms, kindred spirits. I’m looking forward to hearing ‘Sanctuary’ every night. And it’ll be great to have KILLING JOKE along, too. I’ve been a long time admirer of Jaz and his cohorts. I was fortunate enough to be able to work with Jaz, he is a huge personality. It’ll be good to see him again." Since the emergence of the post-punk scene KILLING JOKE have been pioneers across multiple genres from metal, industrial to dance. They have been covered by everyone from METALLICA to FOO FIGHTERS evolving and influencing musical generations for three decades. In 2008 the original members Jaz Coleman, Geordie Walker, Youth and Big Paul Ferguson reunited for a sold out world tour which culminated in the band recording the critically acclaimed album "Absolute Dissent" on Spinefarm/Universal. The album went on to win Metal Hammer "Album Of The Year" and they were honoured by Jimmy Page at the Classic Rock Awards for Innovation. 2012 sees them return with highly anticipated new studio album, "MMXII", released April 2 on Spinefarm/Universal. Speaking on the tour, Youth adds: "KILLING JOKE are honoured and are proud to celebrate together and play alongside THE MISSION and THE CULT, at this great gathering of the tribes. We look forward to unleashing an apocalypse of sonic destruction and giving the crowd a good kick in the teeth."